The Concept of Control- Learning to Trust | My Three Senths: Sports. Business. Life. This is not an opus on micromanagement. Everyone knows that micromanaging is an unequivocally bad habit. This, rather, is on locus of control. More specifically, optimizing your internal locus of control while not being overrun by the external locus of control. Remember Tom Brady’s 2008 season? You don’t, because it didn’t happen. 6 years ago, Brady blew out his knee in the first game of the NFL season. He was the reigning MVP, and suddenly the Patriots faced the haunting prospect of a full season without their future Hall-of-Fame quarterback. Bill Belichick refused to let the season go into the tank. He couldn’t control Bernard Pollard mashing Brady’s knee into pulp. He couldn’t control over a dozen other players going on injured reserve throughout the season. But he could control how he coached and how he managed his team. He had an elite coaching staff around him. He had some of the best offensive skill players in the league. So Belichick did what he never could 13 years prior in his failed stint in Cleveland; he trusted. He trusted in Josh McDaniels, his prodigious offensive play caller. He trusted in Randy Moss and Wes Welker, two of the best pass-catchers of this century. Most of all, he trusted in the work of his scouts and coaching staff, trusted in his roster, and Bill Belichick handed the reins of the offense to Matt Cassell, a career backup. In arguably Belichick’s greatest coaching work, the Patriots went on to a successful 11-5 season that most teams would kill for. When the Patriots had every reason to let their season go into the tank, they flourished instead. 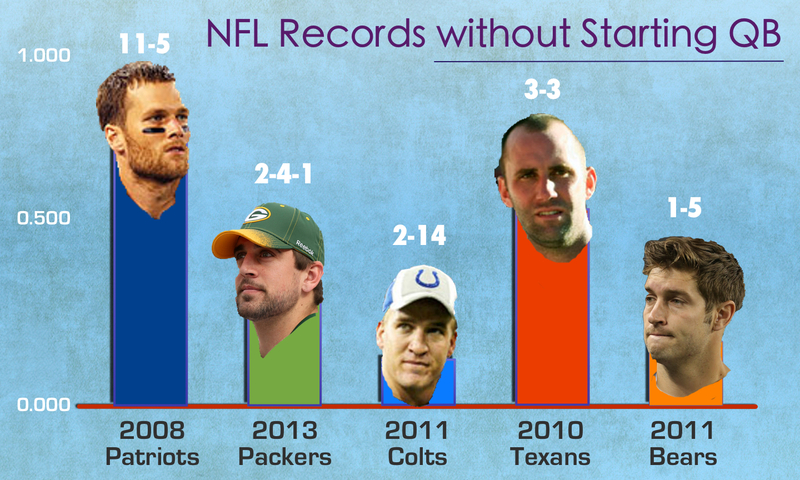 Look at some of the records posted by teams within the last 7 years without their starting quarterback. These are teams that had winning records in games that their regular starting QB played. This should put the aforementioned story into perspective. The chart below is standardized to a decimal record system, how many games won out of how many games played. For example, 16-0 becomes 1.000, 8-8 becomes .500, and so on. All these teams posted winning records when their starting QBs played. The 2008 Patriots narrative helps highlight one of the most important and underrated aspects of introspection and self-evaluation: the locus of control. 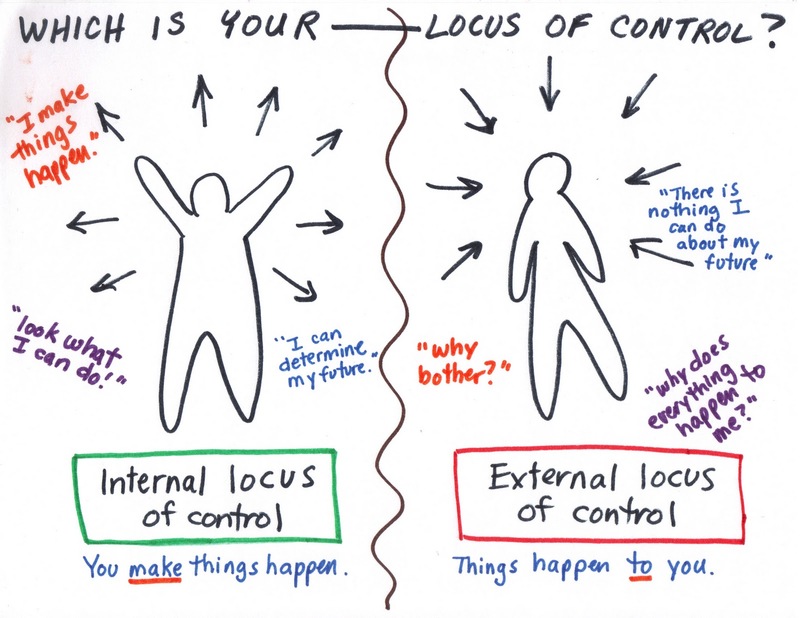 Locus of control is a very good indicator of leadership strength (I stress that it’s an indicator, not a determinant). When business executives, managers, team leaders all try to improve their leadership capacity, one thing to really pay attention to is their thought process on control: do they feel that they control what happens to them (internal locus of control), or are they burdened by the thought that many things are simply out of their control (external)? The strongest leaders will maintain an internal locus of control while acknowledging the factors not in their hands. This is how problems get solved, and barriers get broken through. The strong leaders don’t just worry that the problem occurred; they move to work around it with the resources available to them and solve it efficiently. Understanding what is not in your control is simple awareness. Everyone needs to be aware; problems arise when people think they can control that which they cannot. This is the proverbial fault line where a depressed external locus feeling sets in. It’s when you start feeling overly responsible for something not in your power that you start down the slippery slope of “Why bother?” Leaders with a strong internal locus focus on what they can control, and they in turn master their domain. They make things happen rather than fixating on what they cannot make happen. I sit on the leadership team for a startup accelerator. Recently, some medical emergencies have forced me back to my house in New Orleans, six hours from Houston, where I actually should be. But I cannot control this. Health comes first. What can I control though? The communications pieces I can draft from my laptop. The phone calls I can make and the emails I can send. The rest of my team is still there. I trust in them to continue unscathed and keep the program moving smoothly. I trust in everyone else’s skillsets to make up for my absence. I trust that when I return, they won’t have skipped a beat. I just have to adapt a little, and work through this the best I can. I won’t let all my work or my work ethic go into the tank. I trust the infrastructure around me, and I will continue to work remotely to the best of my ability. I will continue to contribute, just not the same way that I would before. The first step to developing an internal locus of control is awareness, and the second step is to trust. Trust in the system, trust in others, trust in your organizational values, and trust in yourself. You can make things happen. You just need to learn what things you can make happen, and what things others need to make happen. Things don’t simply happen to you. Things happen, and you learn to work around them. There will always be hurdles at any junction in life. But that will not hold back successful organizations like the New England Patriots. That is true for you too. Control what you can, trust in others to support you, trust in the system to keep everything at equilibrium, and sure enough, you will determine what happens to you and around you. You will set yourself up to succeed. ← “Yo” is absurdly simple. And that’s the problem. thanks Andrew! Hope everything is going well. LOC – “Locus of Control” becomes the “Line of Control” when it comes to Leadership 🙂 Compelling topic and Eloquently written..